Was he a 'Drug Peddler'? By Bangladesh Media, Our source from Srimongal confirmed that an ‘alleged drug peddler’ who was not proven by the court was killed at Belghar bazaar in Madhabpur upazila of Habiganj early yesterday! It is not clear that if he was killed in’Crossfire’ between his cohorts and members of the Rapid Action Battalion or was killed in an extra judicial manner, while RAB demanded that he was killed in ‘crossfire’! Total number of death toll rose to 1792 since the Rapid Action Battalion was formed since 2004. 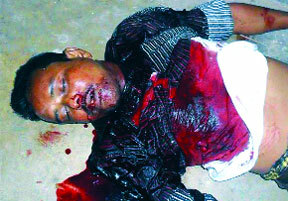 He was identified as Abdul Hakim, 40, son of Abdus Samad of Itakhola Nayapara in the upazila. RAB officials demanded that “Hakim was a known drug-peddler in the area, was accused in 13 cases!” Our source could not verify about these accusations but it is clear that even if it is true, none of them is yet proven by the court! As usual, RAB spoke person of Srimongal demanded that “RAB men found the bullet-hit body of Hakim lying on the ground while his associates managed to escape.” But it is not clear that whether he was alive at that time or not! And later Hakim was rushed to the upazila health complex where doctors declared him already dead. RAB demanded that a point 22-bore pistol, 100 bottles of liquor, 50 bottles of phensidyl, four kgs of hemp and a machete were found near the body. The body was sent to the Habiganj Sadar Hospital for an autopsy. Rapid Action Battalion (RAB) of Bangladesh is known for its extra judicial killing since 2004.